It seems when it comes to thing related to cars, the old adage 'you get what you pay for' really rings true. This can be said of different brands, different tyres or even engine oil. 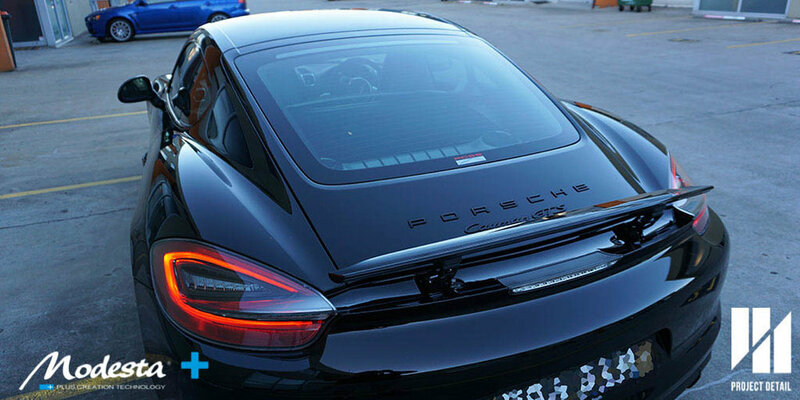 The Porsche Cayman GTS had previously been wrapped by another company. The owner was very particular about the looks of his car, especially being a solid black colour with matte black wheels. After assessing the vehicle, the decision was made to not only rewrap the entire vehicle but also coat the surface with our Modesta BC-05 Advanced Water Repellant Coating. 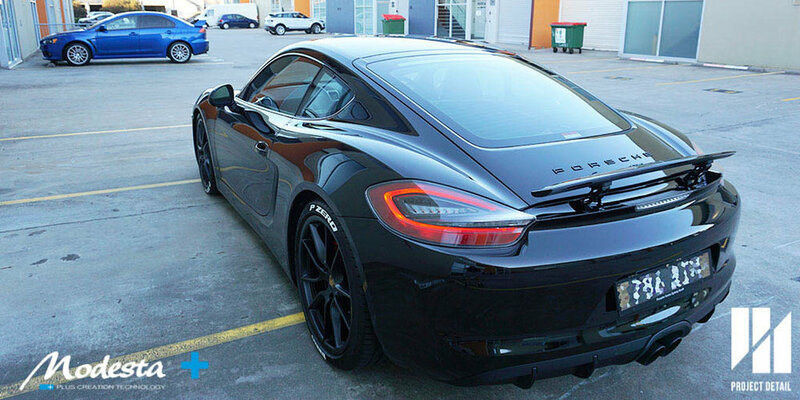 In addition, the customer asked us to apply tyre decals to break up the black and increase the sporty look of the car. The previous wrap was done by bulk fitment which means that while the overall fitment was very close to the edges, after removal and close inspection there were cut marks from the blades used and some of them were extremely deep. The rear quarters were done in two pieces, leaving a big ugly seem along the panel. Worst of all, the car was 'bulk fit' leaving painfully deep cut marks on the paintwork. Once the vehicle was inspected, removing of Paint Protection Film especially on a whole car is a delicate but time consuming process. Removing it without care can lead to damaging the paintwork underneath especially if stone chips or damaged paint is present. After the removal of the film, a strong solvent was used in order to remove the excess glue, the car was then washed in order to make it sediment free and finally wiped down with an Isopropyl Solution. Removal of the PPF took over a day to complete. Looking closely at the existing PPF, the film has begun to yellow which affects the overall clarity and looks of the car. 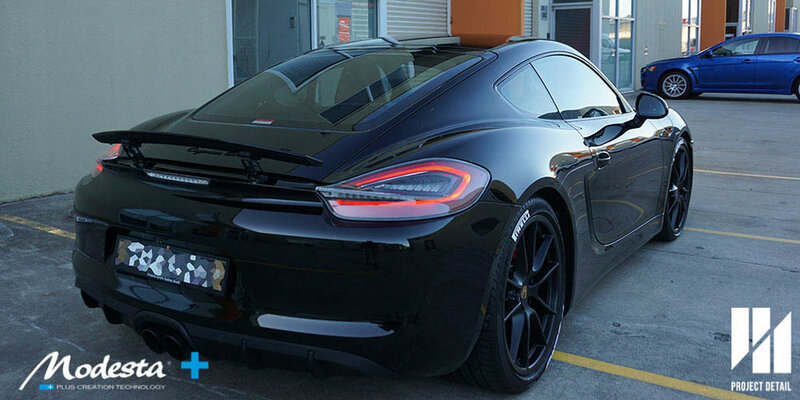 We prepared and reapplied XPEL Ultimate Self Healing PPF to the Cayman GTS. This was a professionally Pre-Cut Template which had fantastic fitment and removed a lot of the trim lines. For example, the rear quarters were able to be done in one piece rather than two and having the seem down the panel line. 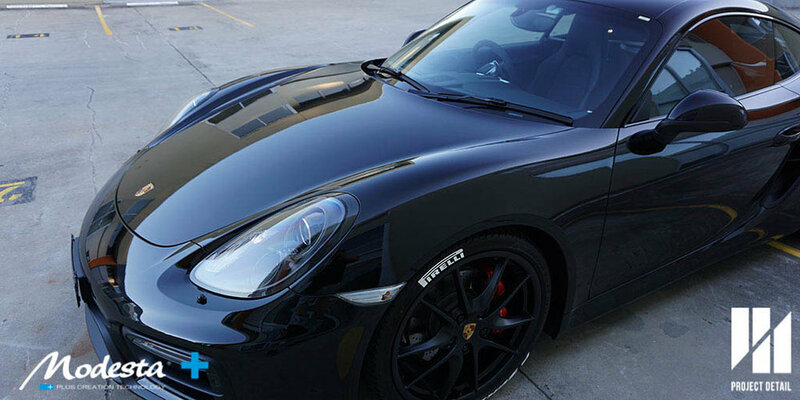 The advantage of using a proper pre-cut template allows a superior fitment not only for edges and seems and safer installations but the cut out includes perfect fitment for areas like the badges, especially for complicated vehicles like Porsches. 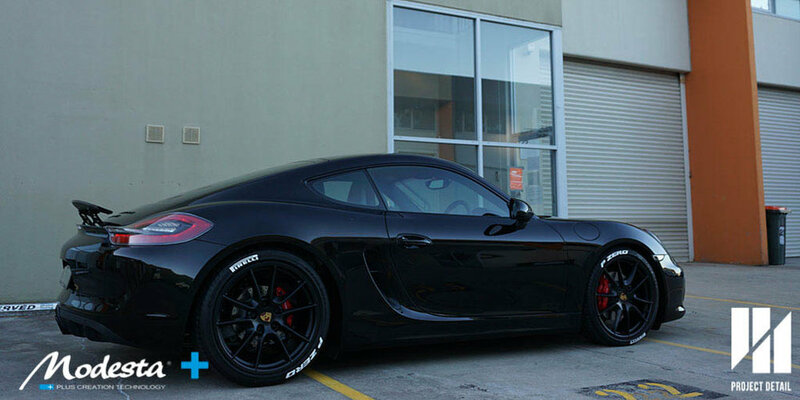 Porsche Cayman GTS PPF reinstallation is complete. To complete the rest of the custom service for the customer, the wheels were removed and deep cleaned before hand. The tyres were degreased thoroughly and the decals were applied using a special adhesive. These require several hours to cure before being able to be driven. 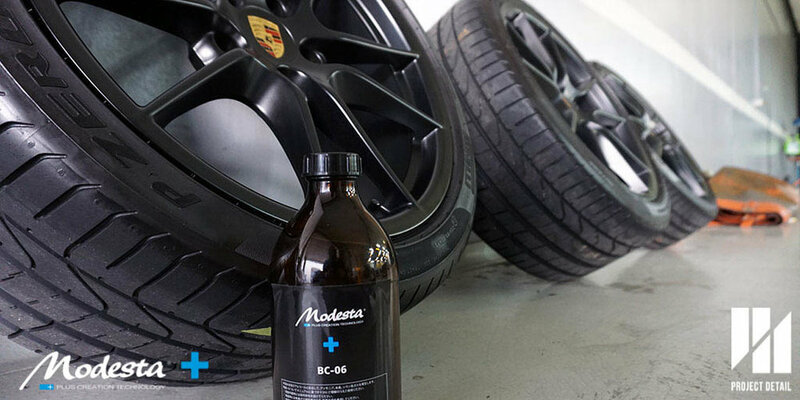 In the meantime, BC-06 Heat Resistant Coating was also applied to the wheels and brakes give them long lasting protection against brake dust and debris. Applying a quality coating to the wheels also allows easier cleaning. Once all the wheels were re-applied and Modesta BC-05 was applied to the paintwork. The car was finished, we inspected all the edges and every panel that had PPF to ensure the best quality especially for a solid black car. The pre-cut templates allow the closest and best fitment around complicated badges and other parts of the car. This is vastly superior to hand cutting and also allows a better design, the previous design had left cut marks and also was a ugly rectangle rather then a custom fit. The car looks simply stunning in the later afternoon light, with the PPF being installed correctly and a high level coating being applied, the car's appearance has reached a new level. 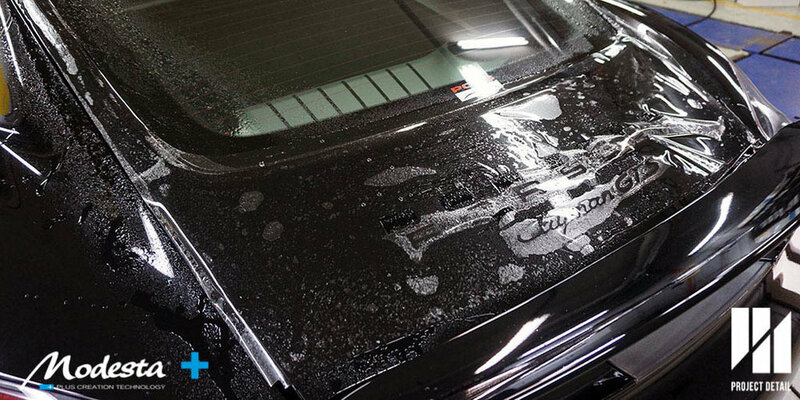 The PPF also receives the benefit of the coating which is prevention of oxidisation, better level of gloss but also the surface is now hydrophobic.